> Dried Chilies>Pequin>Dried Pequin Chile 8 oz. 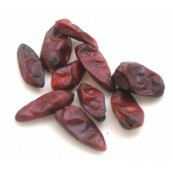 Dried Pequin Chile 8 oz. A flash fire would be the best term to describe the heat of chili pequin. This tasty chili is the ancestor of most chili varieties out there, from jalapenos to sweet bell peppers. Looking like a hot volcanic puffed rice kernel, dried Pequin Chiles are roughly ½” long by ¼” wide and are reddish orange in color. Pequins are often associated with cuisine from the mountain ranges of northern Mexico. Pequin Chile translates to “tiny chile” and chile heads know that the smaller the chile is in size the larger it is in heat! On the heat side these come in at about an 8-9 on a scale of the heat scale of 10. The flavor profile of the Pequin chile is citrusy and nutty with a hint of smokiness. Also known as “bird pepper” this is a favorite of many bird species who enjoy the fruity flavor but unlike mammals are immune to the heat. Pequin Chiles are a common ingredient in liquid hot pepper seasonings and with their rich flavor they add a fiery zest to beans, sauces, soups and stews. Easily crush the dried chiles and sprinkle on bean and rice dishes, homemade salsas and any number of Latin dishes in need of some spicy, tangy flavor. Capsaicin, which it's present in chilies, has an antibacterial effect, so food cooked with chiles keeps for longer without spoiling. Chiles are rich in vitamin C and are believed to have many beneficial effects on health. Dried Pequin Chile 2 oz. Dried Pequin Chile 4 oz. Dried Pequin Chile 1 Lb.